This is the main location where all your guides will be displayed and managed. 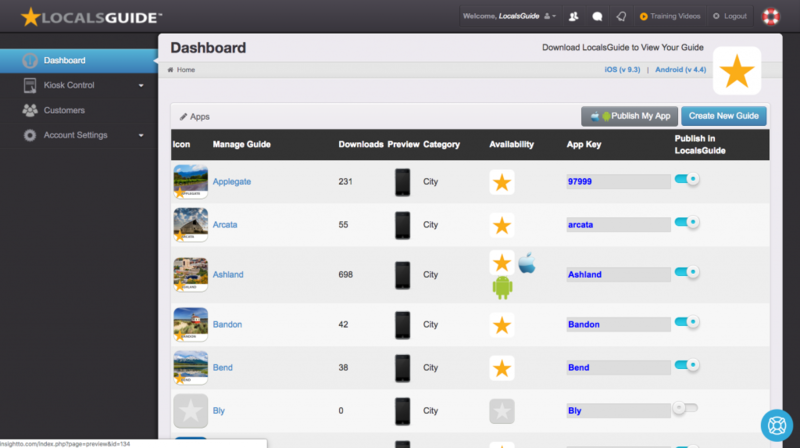 You can easily add new guides, claim new cities and publish your guides into the LocalsGuide Network From This Location. The icon column displays your official app icon that will be used to represent your guide. This icon is used in the main LocalsGuide network and also used when you publish a white label app as the main app icon. 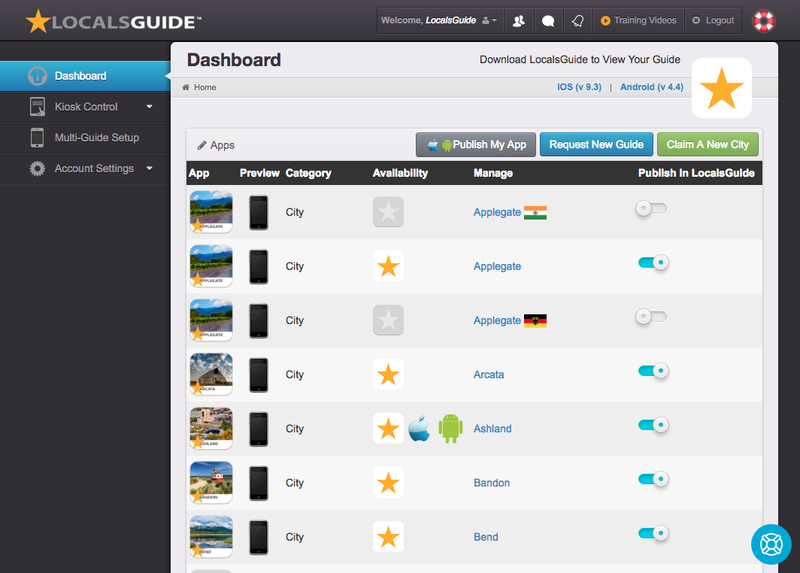 All icons are standardized to match the LocalsGuide Branding. Under the manage column click the name of your guide to gain entry to the Guide Control Panel. From here you can control and manage your entire guide. This shows how many times your guide has been accessed. The preview column gives you an html preview of your guide. The category column displays the type of guide that you are building. Categories range from City Guides to Museum, Travel, Film Festivals and more. The availability column displays t current platform availability. Keep track here. It can be available in iOS, Android or LocalsGuide Network. This is your private key that you share with your customers so they open and view your guide. You can change the key anytime simply by typing a new key here. Please note the change is instant. Instantly publish your guide into the LocalsGuide network with the flip of a switch. Please note the first time a guide is published it will be submitted for review. Review may take up to 72 hours before approval in the network. If you desire to publish a white label version of your app click here. You can publish your guide in iOS or Android. Add additional guides into your base account. All guides are linked to your main city license. Additional guides range from Art Guides to Winery Guides but are all linked to the primary city. Claim another city and add it to your account from here. This will then allow you to add additional guides to this city. Click this link located in the top right of the control panel to download the latest version of LocalsGuide in either iOS or Android. You will find community alerts are pulled in dynamically from Community.LocalsGuide.com. Keep up to date on everything that is happening community wide. Click this link found in the top navigation bar to open the training video library. Found in the lower right of the screen, click the blue life raft to begin your search. Search results will take you into support archive.